Nancy L. Smoldt, 85 of Viola, IL died Wednesday, August 22, 2018 at Genesis Medical Center in Silvis, IL. Services are 2:00 p.m. Sunday, August 26, 2018 at the New Life Assembly of God in Aledo. Burial is in the Viola Cemetery. Visitation is 3-5 p.m. Saturday at Fippinger Funeral Home in Aledo where memorials may be left to the Open Bible Mission in Des Moines. Online condolences can be made at www.fippingerfuneralhome.com. She was born June 24, 1933 in Ferguson, IA to Lloyd and Edith Ferguson Miller. She graduated from Ferguson High School and married Robert H. Smoldt February 24, 1951 in Kirksville, MO. Nancy was a homemaker and assisted her husband in his Church of the Open Bible ministry in Iowa and Illinois for 45 years. She was a former member of Open Bible Church in Aledo and its Women’s Fellowship. Nancy was currently attending the New Life Assembly of God. She enjoyed sewing. 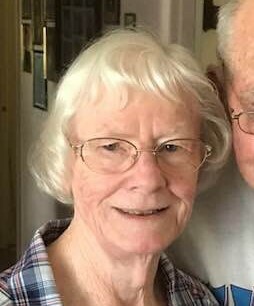 She is survived by her husband: Robert; 2 daughters: Robin (Doug) Campbell of Aledo; Vicki (Kent) Dickerson of Des Moines; 2 sons: Craig Allen (Della) Smoldt of Aledo; Jeffrey (Sarah) Smoldt of Alexis; 13 grandchildren; 16 great grandchildren and a sister: Joan Black of Wichita, KS. She was preceded in death by her parents, a son: Daniel, 2 brothers and 2 sisters.